There is no confirmation news yet about how the trend started? It seems to be related to the Oscars selfie featuring a horde of gorgeous A-list actors, which was retweeted endlessly following the film awards in March starting. Or it would be reaction to the negative comments directed towards 81-year-old actress, Kim Novak, who was criticized for her looks and author Laura Lippman, who posted a picture of her no make-up face in support of this actress. However, the trend seems to be associated with charity Cancer Research once people began adding the hashtag #breastcancerawareness to the selfies. It is true that hashtag wasn't started by a cancer charity, but CRUK (Cancer Research UK ) quickly jumped on board wherein the charity sent out a tweet saying: “We’re loving your #cancerawareness #nomakeupselfie pics! The campaign isn’t ours but every £ helps #beatcancersooner.” Even, CRUK set up a text number to make donating much easier. A Cancer Research staff member posted a makup-free photo holding up instructions on how to donate, along with other charities followed suit. Thus, Cancer awareness became the theme, and selfie posters pledged donations to cancer charities. 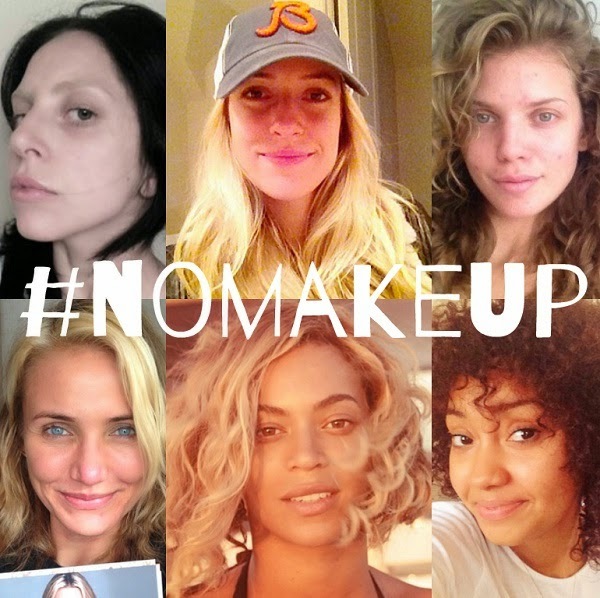 The ‘no make-up selfie’ campaign was started on social media on 18 March, 2014 Tuesday afternoon. On 20 March, 2014, Cancer Research UK received more than £1 million in donations from 800,000 text donations. And, it doubled in another 24 hours as the campaign surprisingly raised more than £2 million for Cancer Research UK on the very next day. "This is the first time I've ever done something like this. I would normally view posting selfies as quite a vain thing to do. But this is different" stated Helen Joyce, who posted a #nomakeupselfie on her Facebook page. There are number of celebrities that supported the campaign like actress Kym Marsh, also singer VV Brown, who wrote on Twitter: "My aunty Sandra sadly died to Breast Cancer. This is my #nomakeupselfie for #breastcancerawareness. Spread the word!" The #nomakeupselfie trend has been greatly criticized stating that it has little to do with breast cancer, and it’s not raising money for charity, however some words of Cancer Research UK prove those critics wrong. Director of communications at Cancer Research UK, Carolan Davidge told, "The #nomakeupselfie Twitter trend isn't something Cancer Research UK started but it's great to see so many people getting involved to help raise awareness of cancer amongst their friends and family. If people would like to choose to support our work to beat cancer sooner, they can visit cruk.org." You maybe glad to know that there is also a male version called #manupandmakeup. Herein, men put on make-up and take a selfie to donate to charity Prostate Cancer. Things are different for both the male and female versions, however the purpose is the same to raise money for cancer. Both the trends are spreading fast, also people are nominating their friends to post a selfie to raise money for cancer awareness and donations.